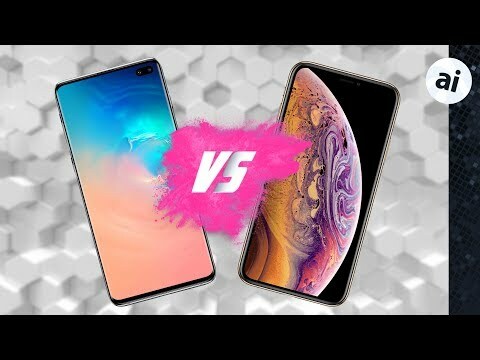 Full detailed comparisons of the new Galaxy S10 models will be made once the new phones hit the market, but for the time being, it's worth taking a look at the latest launches on paper to see how they stack up to the latest iPhones. Samsung's lineup now looks similar to Apple's latest offerings, with three mainstream devices consisting of the standard Galaxy S10, a larger S10+ model and a budget-oriented Galaxy S10e model that is clearly targeting the iPhone XR, complete with a $750 price tag. There was also the announcement for the $1,980 Galaxy Fold, but a closer examination of that device is for another time. The S10 and S10 Plus come in at $100 less than Apple's competing devices, but pack in a lot of new tech. The 6.1-inch S10 has a larger display than the 5.8-inch S10e, but the Plus model's 6.4-inch screen is smaller than Apple's 6.5-inch XS Max. As usual, they are high-resolution OLED displays, but this time with the HDR10+ certification which is the first specification that could give Apple fans a bit of envy. 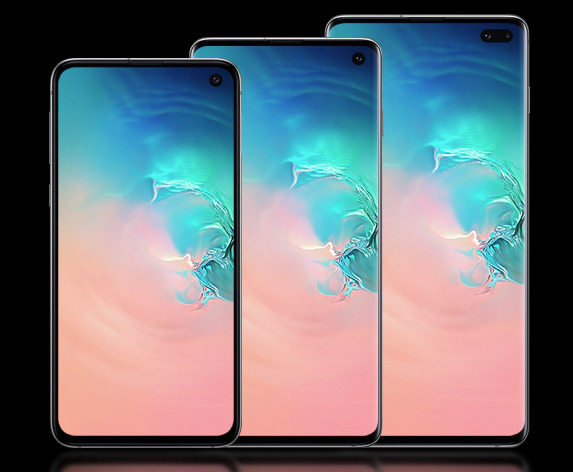 The Samsung Galaxy S10e, Galaxy S10, and Galaxy S10+. Camera cutouts are in the top right corner of each screen. Apple's iPhone XS Max is measured to put out just under 700 nits, but the S10's are rated up to a shocking 1,200 nits of brightness, so you'll have no problem using it in direct sunlight, and this is also what allows for the HDR10+. The display takes up most of the front face , with a chin larger than the iPhone's, but one thing that's missing compared to most other smartphones is the lack of a notch. 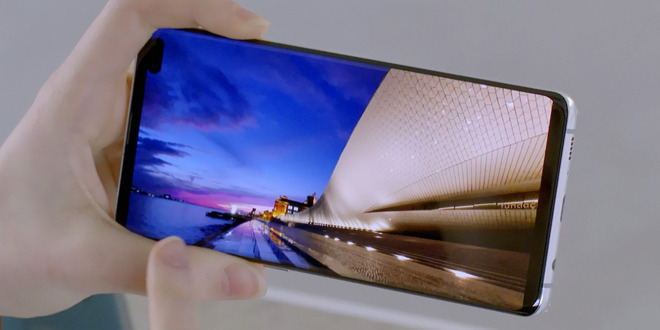 Instead, Samsung skipped that trend and opted for camera cutouts, allowing for more of the screen to be used and not wasted with empty black space. 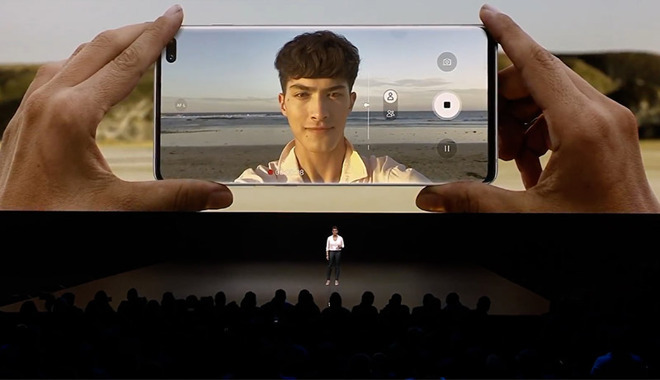 Inside of those cutouts, there is a 10-megapixel shooter in the S10 capable of recording 4K video, with the S10 Plus adding a wide-angle 8MP camera for depth sensing. The iPhone XS and XS Max feature a 7MP shooter limited to 1080p at 60 frames per second. On the rear of the S10+, instead of offering two 12MP cameras, a standard and portrait lens, we now have a triple camera setup made up of two 12MP shooters and an additional 16MP ultra-wide lens camera. The photos shown by Samsung look admittedly great. A wide angle lens is something we have wanted from Apple for a while and is rumored to come in Apple's next flagship iPhone. As with previous Samsung models, the standard lens has dual apertures which helped with low light photography when we compared it to the iPhone XS in our camera comparison. One area the iPhone XS trumped the Note 9 was video stabilization and dynamic range. Samsung's punching back with their "Super steady video" mode and High dynamic range recording. The latest iPhones will combine alternate video frames if shooting at 24 or 30 frames per second to improve dynamic range but the video file was still SDR, whereas the S10 will save the file in HDR so its ready to upload and view in full HDR for compatible displays. Unlike Apple's Face ID, Samsung is doubling down on fingerprint authentication with its new under-display ultrasonic fingerprint scanner. Unlike the OnePlus 6T which was the first mass-market phone to bring this kind of tech to the U.S., the S10 doesn't require the display to be on or to shine a bright light since it isn't an optical sensor. This also means it'll unlock the phone faster. Many will still prefer Face ID, which doesn't require you to place a finger in a certain spot and can be used for Apple Pay and Safari Autofill. As for the ports, it uses USB-C along with a headphone jack that still allows for an iP68 water resistance rating, which may be one of the reasons Apple removed it. On the inside, the S10 has a 3,400 mAh battery compared to 2,658 mAh on the iPhone XS. The S10 Plus has a massive 4,100 mAh compared to 3,3174 mAh in the XS Max. iOS is more power efficient than Android but with batteries that much larger, the S10 devices will definitely have an edge. One new trick is the ability to wirelessly charge other devices, such as the new Galaxy Buds. This is also a feature rumored for the next iPhone. At the heart of this new phone, we have the new 7-nanometer Snapdragon 855 for the U.S. market, and early benchmarks show Geekbench 4 scores of around 3,500 in single-core and 11,200 in multi-core tests. These are top notch scores but they still don't beat the half-year-old iPhone XS which has a slightly higher multi-core score of around 11,450 and a much higher single-core score of 4,800. On the graphics side, GFX bench Manhattan off screen test results in a high score of 102 fps, over 20 percent faster than the Note 9, but not enough to beat the iPhone XS' A12 Bionic chip's 122 fps. They also include an NPU, or neural processing unit, a competitor to Apple's Neural Engine. As for RAM, we have much more than the iPhones XS' 4GB, starting with 8GB on the lower-priced models and jumping all the way up to 12GB if you buy the version with a 1TB storage capacity. This is good news for Android since the OS requires more memory to stay smooth and keep background apps open compared to iPhones with iOS. Storage on the S10E starts at 128GB, which is a $100 upgrade on the iPhone XS. The Galaxy S10 uses the latest Wi-Fi 6 for wireless networking and 2Gbps LTE for cellular access, offering faster connection speeds if your service provider can provide it. Samsung is still offering a microSD card slot for memory expansion, which would be a welcome addition that is extremely unlikely to appear in an iPhone. The S10e is a direct rival to Apple's iPhone XR in many ways. Priced the same at $750, glancing at the front it even looks a bit like the iPhone XR, except without the notch. The display size matches the XS at 5.8 inches but is smaller than the XR's 6.1-inch screen, while being practically the same size. One major difference is the display technology. Apple chose an LCD for cost savings, but Samsung used its OLED displays, and this one doesn't disappoint as it uses the same HDR10+ ultra bright panel as the S10. This was arguably the biggest disappointment with the XR, so it's impressive that Samsung stuck with an OLED for their more budget-priced model. Just like the XR, the S10e has less RAM than the flagship, but it's still twice as much as the iPhone equivalent offers at 6GB against 3GB on the XR. This doubling goes along to storage as well, with the S10e having 128GB as standard compared to 64GB. If you move up to 512GB of storage the RAM will also bump up to 8GB. Another similarity with Apple's offering, Samsung is putting the same high-end chip in their $750 phone, giving it comparable processing power to the other models. On the back, neither the iPhone XR nor Galaxy S10e has a dedicated telephoto lens, but the Samsung does have two cameras, the second being the 16MP ultra wide shooter. Battery-wise, the S10e leads with a slightly larger 3,100 mAh battery versus 2,942 mAh, but thanks to iPhone's superior power management, the XR should lead in real-world battery life. Overall, we are quite impressed with Samsung's latest flagships. Not only do we have new technology packed in but also at a lower price than Apple's offering, especially when you compare base storage amounts. The iPhone XR's biggest downside, the display, is a non-issue on the S10e. The Samsung S10 can be preordered from Samsung directly or at authorized dealer B&H Photo. Samsung is also offering a rebate for free Galaxy Buds with S10 and S10+ preorders. AT&T Wireless: Get up to $1,000 in bill credits with Galaxy S10 preorders. Verizon Wireless: Get up to $300 off iPhones with an eligible trade. Sprint: Lease the latest iPhone and get an iPhone XR for free. The only upside I can see with this announcement and having Apple revisit pricing on their current devices. TL;DR I'm not ever owning a Samesung device. Ever. I did however, just buy a new iPhone Xr a few hours ago. It is stunning. As is the new Apple Store in Seattle. A great experience. They definitely hit a lot of the right notes and will be far more flexible on pricing than Apple over the coming months. Next up is the Huawei P30 Series and by the time the next iPhone refresh is due, both the Note and Mate series will have taken things up another notch. As long as there is intense competition, I think we should all see some benefit. So no FaceID type tech? It is very ironic that no media talk about what Android OS this phone will run on. The media seems to feel there is no difference between iOS and Android OS now. I'm fine with Samsung having some truly competitive phones (unless you like security that is) at competitive price points. Competition is good, it keeps Apple (and everyone) on their toes. That said, I don't care how great their cameras allegedly are ... after the reading I've been doing, I wouldn't touch a Huawei phone if you gave me one for free. Google and Android are quite bad enough about personal info, but China takes this to a whole new level. Samsungs new displays look great but a whole on one side and not centered would drive me insane. That's why the notch is my bag. it’s also a non-issue on the XR. A 3-column table will explain better than an article. Interesting option if I were in the market for a new phone but I'm happy with my iPhone XS and probably will be for at least four years. All of the improvements are welcome but are incremental as seems to be all improvements in all cell phones these days. Basically, people will be upgrading based on need versus the bi-annual or whatever schedule people are on these days. I stay with Apple for privacy and the fact that they update the operating system on their products fairly well. Meh, nothing stands out to me. It's just the typical incremental upgrades we get every year from all smartphone companies. Yet when Apple releases an iPhone with "incremental" upgrades it's a failure but when Samsung (or others) do it it's innovative? As to the screen, I doubt that 1200 nits is full screen brightness. The Note 9 could achieve 1050 nits peak, 825 nits up to 50% of the screen and 710 nits full screen. That 1200 figure is undoubtedly the peak brightness for a small area. As to HDR10+, I have an issue with their claim. Samsung has never before shipped devices with individually calibrated screens (like Apple has been for years) and Androids version of color management is inferior to that in iOS. So while the display can technically achieve the color gamut and dynamic range necessary for HDR10+, that doesn't mean the display is accurate or that all content will render correctly. We'll have to see if Samsung still has those stupid "modes" the user can select for what they're viewing. A device that's calibrated and has color management doesn't need the user to pick a "mode" before viewing content. Cutout vs notch? It's different but not necessarily better. The area around the cutout is useless for displaying information so they might as well have just put a full cutout (notch). Though I now predict lots of wallpapers so people can "customize" their cutout by putting something around it. I suggest a sunflower. You heard it here first when you see one show up in real life. RAM? Meaningless. Android devices always have extra RAM to make up for their piss-poor inefficient OS. SO to see yet more again isn't really surprising. Depth sensing on the front camera but not utilizing it for something like FaceID? And dropping Iris scan? What, then, is the point? I thought Android users were to sophisticated for Animoji or Instagram, but it appears that's what this extra camera is for. The triple camera on the rear is an upgrade, but still just incremental. The 5G version with the time of flight camera on the rear is a significant upgrade, but again, who's going to use it? Android developers are always lazy when it comes to modifying Apps to take advantage of new features so it'll be interesting to see what happens. The next iPhone is rumored to have a TOF camera as well, and if these cameras are available to manufacturers now then it's a given the iPhone will get it. The only difference is within weeks of the iPhone coming out there will already be more software to utilize it than Samsung will manage to get over the next 6 months. Fingerprint sensor under the screen? We've seen these already. Samsung was smart to use the ultrasonic version (better security than the image based ones) but in the end it's still a fingerprint sensor and inferior to FaceID for security. And while it seems cool, without an indent or other physical cue you're still going to have to look at your screen most of the time when you unlock (no more unlocking while you pull your phone out of your pocket, like you could with TouchID or Samsungs rear fingerprint sensor). Processor? An upgrade, but still behind the A12. It's irrelevant anyway, since there's literally no Android software that can actually utilize those cores. So you've got a 600HP turbocharged V12 connected to a pair of 13" Mini wheels. So overall, an upgrade. But still the same we see every year from Apple and Samsung. There is no reason to think Ultrasonic is more secure than Face ID. Does this mean that the finger has to be placed at a certain location, even though this is an under-display scanner? It isn't an all-screen under-display finger scanner? So, Samsung skimped on the FaceID equivalent, which allowed them to throw in some impressive hardware. At first glance, the Samsung models are a better value. But as usual, it all depends on how much value you derive from being part of the Apple vs. Android ecosystem. I will not have a Google/Android product in my house! Google/Facebook are all about surveillance! No thank you. It’s still Android. Last year I began managing an app for our company and I had to buy Android test devices and learn the OS. I’ve always been an Apple person and honestly I assumed that Android was probably about as good as iOS, but boy was I wrong. The UX of Android is horrible, and it is different on each device made by different manufacturers. The much-heralded better “customization” of Android is really just a cover for a lack of basic features. And talk about a nightmare for development. I’ll give you a good example: video. On iOS, all I have to do is make sure our video works on the latest and last version of iOS and I’m good to go. That is because iOS has a built-in video player that can be used natively by all apps. Seamless. Not so on Android. There is no video player native to the operating system. Therefore each manufacturer, in conjunction with your carrier, bundles a different video player with each device. Usually this is some cheap video player that has problems with all manner of video encoding. We have four testing devices and when we first tested video in our app, it played fine on one device, audio didn’t play on another, video played on another but no audio, and on the last the video didn’t work at all. No, not a joke, really. We then downloaded another third-party video player (VLC, considered to be best in class) onto each device and, yes, video worked on all at that point. This is the much ballyhooed “customization,” you get to/have to download different third party apps to do basic functions like play video. What a nightmare for developers! This causes so many problems you wouldn’t believe it. Even if you have a good player downloaded, when the video plays it jumps out to the different app to play, and then back to your app if everything works properly, which of course it frequently doesn’t. Our app has 4.8 stars on iOS, but just 3.8 on Android mostly because of the video playback issues. I’d say 90% of our help desk tickets on the app are for Android, and probably 50% of those are for video playback problems, of which most are entirely related to the cheap player that they have installed or some unknown bug that is preventing the video player from performing correctly. I could go on but you get the idea. It seems to me that this, along with slower iPhone sales, is an industry game changer: Specifically that Apple has been dragged into a new phase of war based on features and price. Specifically Apple will now have to seriously start thinking competition over gross margin. While they will continue to compete at the high end on technical features without regard to price, at the mid level they will need to compete on both features and price. They're free ride is over. Samsung just threw down the gauntlet. Yeh, Donald has declared war (trade war) on all things Chinese. The spying thing is just the standard Republican tactic of trash talking their opponent.